In order to use the Wine Station at Broad Street Wines you will need a special payment card that you can purchase at the counter. We offer prepaid cards in any dollar amount. The card can be purchased directly with cash, credit cards or if you will be purchasing more wine, just add it to your bill. 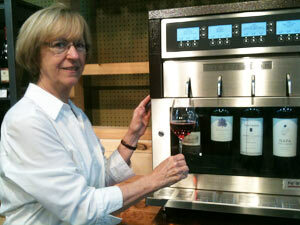 Now that you have your Wine Station card you can begin sampling the wines in the station. Just insert your card into the slot on the top left (black strip on the card should be facing you) leave the card in the slot until you have selected your wine. Hold your wine glass under the nozzle of the wine you want to try. 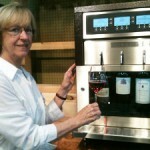 Make your selection of taste, half glass or full glass by pushing the appropriate button at the top of the wine station. The wine will pour out of the nozzle into the glass in the selected portion. If the bottle is emptied before your portion is complete, don’t worry you will be charged only what you received in your glass. 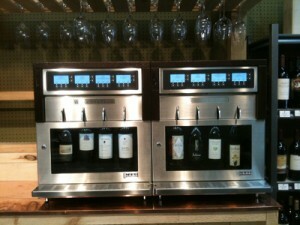 The wine station will show the balance on the card each time so that you will always know how much money is available. We recommend that you do a tasting of the wines featured in the Station until you find one that you like. When you find that perfect taste you can purchase that bottle of wine with confidence that you’ll enjoy every sip. We look forward to seeing you with our New Wine Adventure.